Social Recognition: Are you really social in your social media? Anemic connections. I am finding more and more people in social media are broadcasting updates but connecting very little. You do not really connect with someone when you “like” or “+1” them or list them in a weak weekly Twitter “#FF” -Follow Friday. Geometric yet automated growth. It seems to me that social media is proliferating at a geometric rate but is becoming more personal media broadcasting and less social connection and interaction. If people are not linking to their own material they are linking to someone else’s material and automated services allow you to instantly create a comment and a link with the click of one button. We don’t really need to think about the person or the post. In fact, sometimes it seems I think I have read something when all I did was like it or create a short Tweet with a link attached. People people everywhere but how many are engaged? So many people are using automated services as they simultaneously post on Twitter, LinkedIN, Facebook, and Google Plus with their automated updates. And services will sell you 10,000 Twitter followers for about $50. The screen of updates scrolls faster than the credits at the end of a movie. It seems everybody is updating but very few are paying attention. One small step. This is not meant to be accusatory of other people in social media as I have seen myself lapse into frequent updates and showing my appreciation by clicking on the Facebook like button. I have been involved in social media and blogging for 6 years and I miss some of the tightness of connection I had with such people as Rosa Say, Steve Roesler, Phil Gerbyshak, Lisa Haneberg and so many others. We will not go back in time but I want to keep some of that spirit alive from 5 or 6 years ago in social media. Recognition. I will still update but I intend to balance updates with recognition. I believe social recognition may be one of the keys to bringing social back into social media in an authentic and personal way. The various medias offer tremendous ways to recognize and honor people who have made a difference for you. Let’s face it, we are all co-created by the people we encounter and when is the last time you let someone know the role they have played in you being you? 3WOWS. 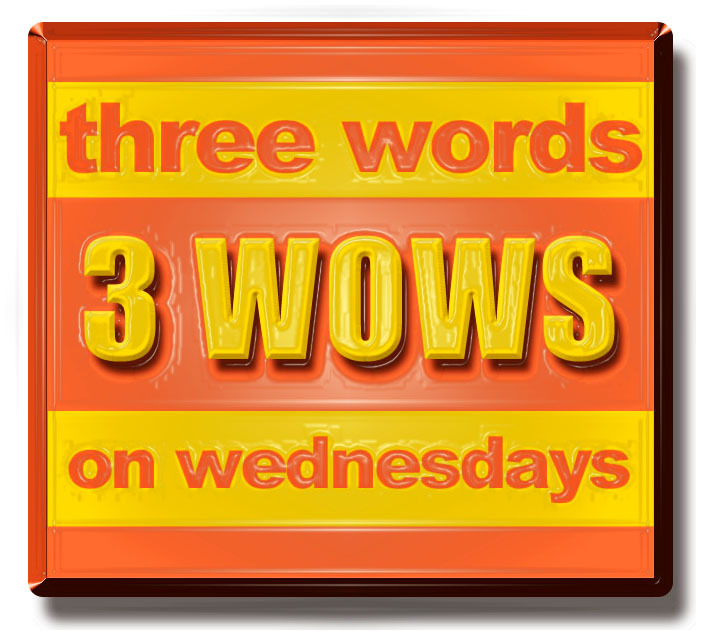 3WOWS stands for 3 Words On Wednesday. 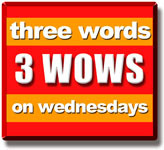 Wednesday was chosen because it helps create the word WOW. It is the third day of the working week and I think it can be a great day to recognize others as they get half way through their week of work. Thanks to John Junson. I want to thank John Junson my brilliant designer and friend for creating the latest button I am using in this initiative. We have the large button and a small button for other updates outside the blog. In the spirit of 3WOWS, John is artistic, detailed, and loyal. 3 Words. I will use 3 words or phrases to recognize people and capture a small portrait of their strengths, attributes, influence, gifts or contributions. In my blog I will elaborate on those words while on Twitter or other social media I will sometimes just use those words. I want other to know that I see them, that I am thinking about them and that I appreciate them. I also want the social media communities I play in to know what gifts or strengths I see in the people I created 3WOWS for. Twitter Hash tag is #3WOWS . It is not my intent to keep 3WOWS to myself. I encourage you to offer 3 words about someone who stands out for you and if you do it on Twitter you can use the hash tag: #3wows. If you want the button I am using please email me and I will gladly send you the jpeg. 3WOW Today. I encourage you to take part of your social media time for social recognition of others by distilling their influence or gifts or strengths in 3 words and broadcasting that recognition to them and your social media community. Who are you going to 3WOW right now? This was an enlightening read; appreciate the human behind the social media face. Recognize them (as anyone would hope to be recognized) – very nice. I will be sure to share this, as it is definitely a practice I would like to see used on CanadaSocialNet. Thanks. Thanks Ray. It is important to me and I think quite a few others. All the best as you go ahead and use this.